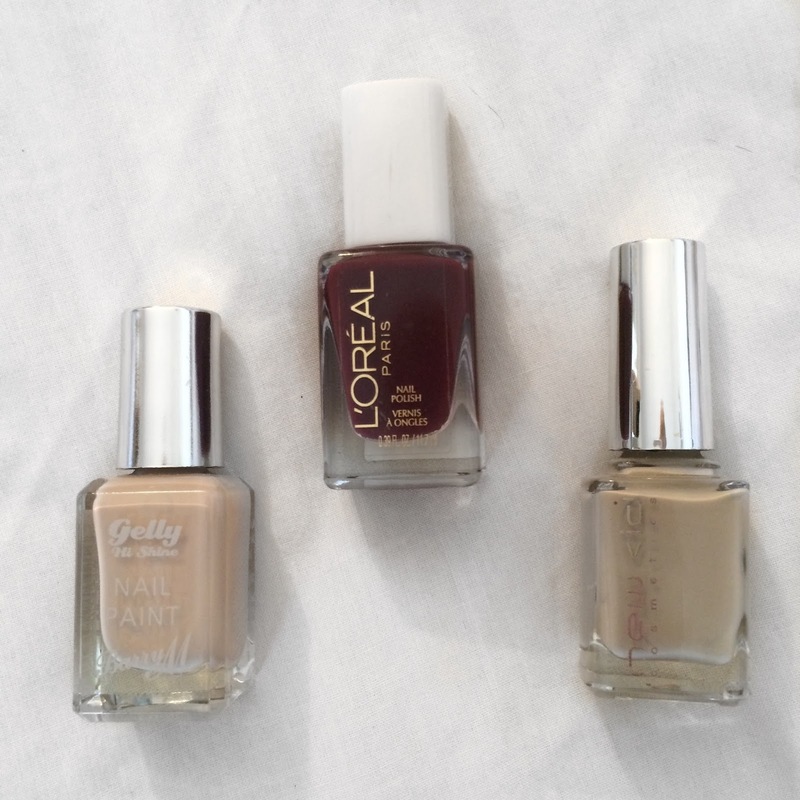 During the Autumn season I tend to go for either dark coloured nail's or a light browny colour, it all depends on what mood I'm in I think. 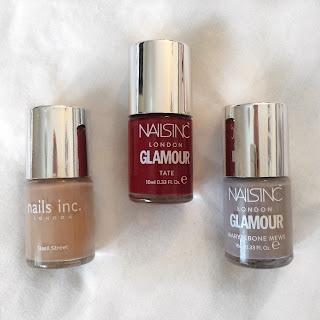 So for today's blog post I've gone through my nail varnish collection and picked out some of my favourite nail varnishes that I like to wear throughout this season. 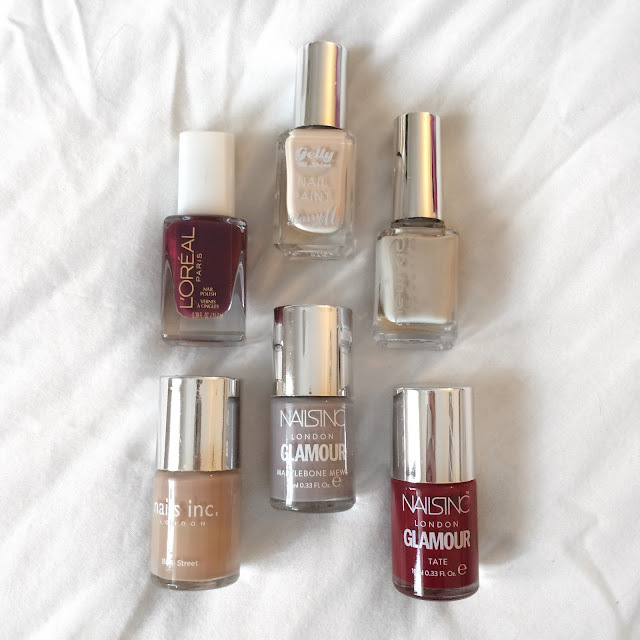 Some of the nail varnishes that I've chosen do look quite similar but I promise you they are all different once they have been applied onto the nails haha. First up are my Nails Inc varnishes, I have quite a few by Nails Inc as I love the way that they apply to the nails and usually only need 1 or 2 coats to achieve the full colour, and with a good top coat over the top the nail varnish lasts quite well aswell or at least for me anyway it usually lasts just over a week before I need to re-do my nails. Nails Inc: Basil Street - This is one of my all time favourites by Nails Inc, a really gorgeous light brown colour and always reminds me of Autumn. Definitely gonna be a re-purchase a some point for me as I've got just under half a bottle of this left where I wear it often. Nails Inc: Tate - A gorgeous dark red colour and one that I find goes well in both the Autumn and Winter seasons because it also reminds me of Christmas. I usually wear this one round Christmas time as I love the colour of it. Nails Inc: Marylebone Mews - I couldn't find a link to this one anywhere, so I'm not sure if it was a limited edition one or not. I've never really been into grey nail varnishes but I really like this one as its a really suttle grey and not to in your face. 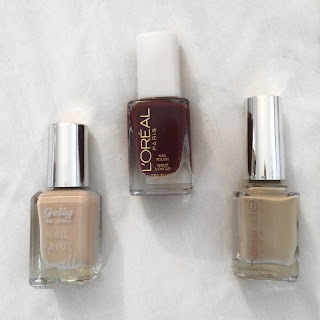 Next up are another 3 colours and these particular ones are by Barry M, Loreal and New Cid Cosmetics, the third one is a brand that I'm not very familiar with but definitely will be researching into them as there nail varnishes last ages on my nails, even better than my Nails Inc ones and for me to say that means it must be good! Barry M Gelly: Lychee - This is a nail varnish that I had heard a lot about, but everytime I went to buy it, it was out of stock everywhere. So as soon as I saw it in Superdrugs I made sure to buy it there and then. Loreal: Breaking Curfew - This nail varnish is like a dark red vampire colour and the name of it really reminds me of what an episode of The Vampire Diaries would be called haha. New Cid Cosmetics: Hazelnut Ice-Cream - I couldn't find a link online to this nail varnish either, in fact I can't even remember where I got this one from, this one is a bit like Nails Inc's "Basil Street" but just a bit lighter. What nail colours do you like to wear during the Autumn season?